Norfolk Island is a small island situated in the Pacific Ocean, to the east of Australia. It is part of Polynesia. Originally there were two British attempts to use the island for prisoners. This happened between 1788-1814 and 1825-1855. In 1856 the island was settled by Pitcairn islanders of whom you can read about below. The island is a self-governing terrotory of Australia, administered from Canberra. The capital is Kingston. The weather is subtropical, which means it is mild with very little seasonal variation. 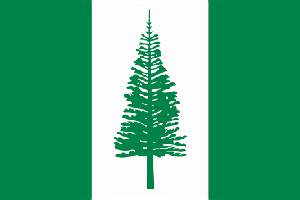 Norfolk Island has a total land area of 36 sq kms. That also includes Philip Island about 8 kms to the south. It has a total coastline of 36 kms and has no land borders. It has a total population of 1,748. 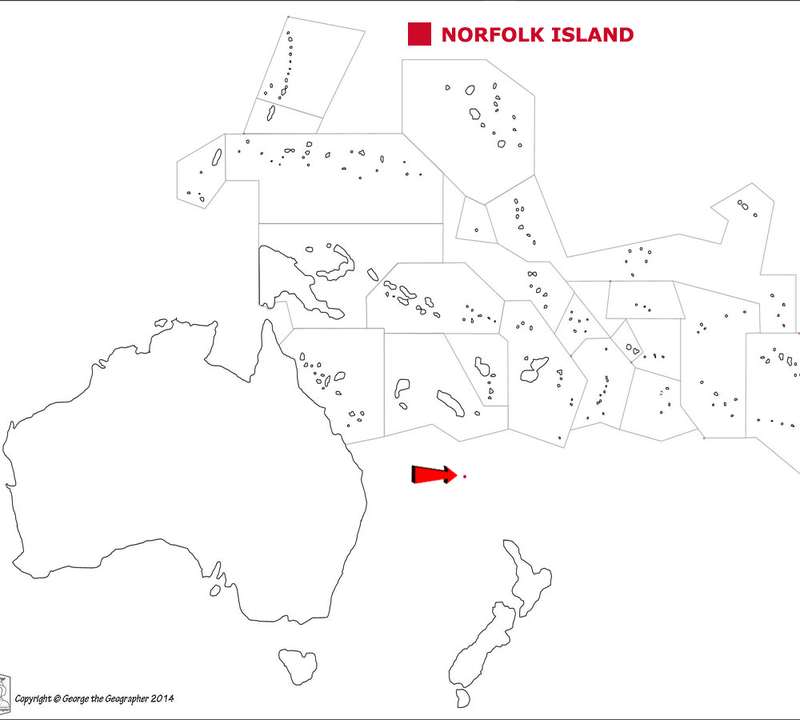 Below is a map showing where Norfolk Island is and the flag of Norfolk Island. Easter Island is a small island in the Pacific Ocean. It is about 3,500kms west of Chile but too far east to be on our Oceania map. Easter Island is a bit of a strange case as it is officially considered to be part of a province in Chile. No one really knows where the first settlers came from although it is almost certain they arrived by canoe. In 1947 the famous explorer Thor Heyerdahl proved that it was possible to sail from South America all the way to French Polynesia. This would have seen him sail past Easter Island. Easter Island was annexed by Chile on 9 September 1888. The weather is tropical. Temperatures range from 24C in January to 18C in August. Easter Island has a total area of 164 sq kms. It has a total coastline of about 100 kms and has no land borders. Easter Island has a total population of 6,600. 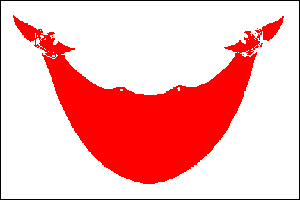 Below is the flag of Easter Island. Wallis and Futuna is made up of three main volcanic tropical islands along with a number of tiny islets and is split into two island groups that lie about 260 km apart. The islands are in the Pacific Ocean. They are part of Polynesia. Wallis and the Futuna Island group have a total area of 142 sq kms. They have a total coastline of 129 kms and have no land borders. They have a total population of 15,714. 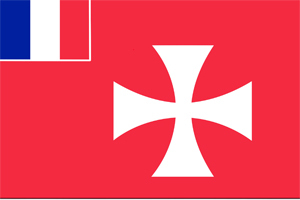 Below is a map showing where Wallis and Futuna are and the flag of Wallis and Futuna. French Polynesia is a collection of 118 volcanic and coral islands and atolls in the Pacific Ocean. 67 of the islands are inhabited. They are part of Polynesia. French Polynesia consists of five island groups. The Society Islands, of which Tahiti is the most well known, the Tuamotu archipelago, the Gambier Islands, the Marquesas Islands and the Tubuai Islands. Spain, Portugal, the Netherlands and Britain discovered at least one of the islands. In the 18th century Europeans arrived and brought diseases that wiped out much of the indigenous population. The missionaries also tried to stop many forms of Polynesian culture which were then lost for many years. Papeete, which is on Tahiti, is the capital. For many years from the 1950s, France used some of the islands to test muclear weapons. The weather is tropical. French Polynesida has a total area of 3,827 sq kms. They have a total coastline of 2,525 kms and have no land borders. They have a total population of 287,881. Below is a map showing where French Polynesia is and the flag of French Polynesia. New Caledonia is a group of islands in the Pacific Ocean. The largest island is called Grande Terre. They are part of Melanesia. The islands were settled by both the British and the French during the early 19th century until France took possession in 1853. It was first used as a prison. In recent years there have been problems between the European settlers and the native Kanak people who represent about 45% of the total population. France had promised to hold a referendum on the island before November 2018 to decide on the territory's sovereignty. The referendum, held on 4th November, resulted in 54.6% voting to remain as they are. 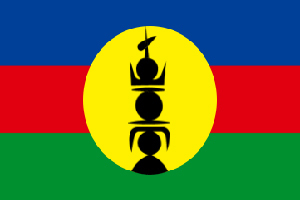 The capital is Noumea on Grande Terre. The weather is tropical. New Caledonia has a total land area of 18,275 sq kms. It has a total coastline of 2,254 kms and has no land borders. It has a total population of 279,070. Below is a map showing where New Caledonia is and the flag of New Caledonia. The Cook Islands are a group of islands in the Pacific Ocean There are 15 islands spread over nearly 2 million sq kms. They are part of Polynesia. The Cook Islands were named by British explorer Captain Cook as the Hervey Islands in 1773. Fifty years later they were renamed after him. 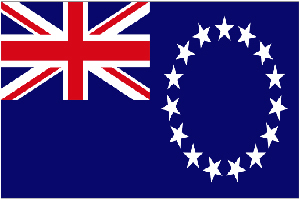 In 1888 the Cook Islands were proclaimed a British protectorate and a single federal parliament was established. In 1901 the islands were annexed to New Zealand. In 1965 the islands became a self-governing territory in free association with New Zealand. The capital is Avarua on the island of Raratonga. The weather is tropical. There is a dry season from April to November and a more humid season from December to March. The Cook Islands have a total land area of 236 sq kms. They have a total coastline of 120 kms and have no land borders. They have a total population of 9,290. Below is a map showing where the Cook Islands are and the flag of the Cook Islands. Niue is a small island in the Pacific Ocean. It is part of Polynesia. Niue was settled by Samoans almost 2,000 years ago. Captain Cook sighted the islands in 1774 and British missionaries arrived in the 19th century. 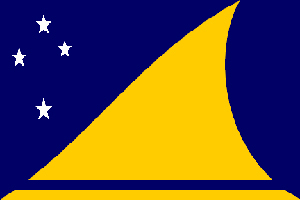 Niue was later administered by New Zealand becoming self-governing in 1974. Many Niueans have left the country to settle in New Zealand. All Niueans are New Zealand citizens with New Zealand looking after Niue's defence and foreign policy. The weather is tropical. Niue has a total land area of 260 sq kms. It has a total coastline of 64 kms and has no land borders. It has a total population of 1,618. Below is a map showing where Niue is and the flag of Niue. Tokelau is a group of three coral atolls, Atafu, Nukunonu and Fakaofo, that make up this Polynesian island in the Pacific Ocean. Tokelau is one of the most remote islands in the world. It has no airport and the sea journey from Samoa takes over a day. It is administered by New Zealand and has twice, in 2006 and 2007, voted to remain as a New Zealand territory and not be free-governing. Tokelau is very low lying and if oceans rise it could be submerged. The weather is tropical and Tokelau is vulnerable to cyclones. Tokelau has a total area of 12 sq kms. It has a total coastline of 101 kms and has no land borders. It has a total population of 1,285. 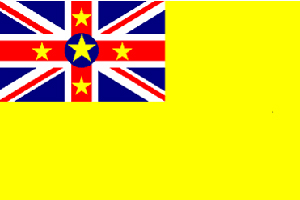 Below is a map showing where Tokelau is and the flag of Tokelau. Pitcairn Island is a very small island in the Pacific Ocean. It is about midway between New Zealand and Peru and too far east to be shown on our Oceania map. Pitcairn Island was discovered by the British in 1767. Sailors from the ship HMS Bounty settled there in 1790 along with some Tahitians. The sailors had mutineered (rebelled) against their captain and set him afloat in the middle of the Pacific Ocean, along with a few others, in a small rowing boat. They took the ship to Pitcairn. In recent years the number of inhabitants has dropped from 233 in 1937 to the present figure. The weather is tropical with a rainy season from November to March. Pitcairn Island has a total area of 47 sq kms. It has a total coastline of about 51 kms and has no land borders. It has a total population of 54. 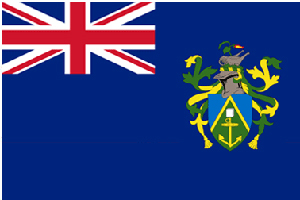 Below is the flag of Pitcairn Island. American Samoa is a group of islands in the Pacific Ocean. It is part of Polynesia. 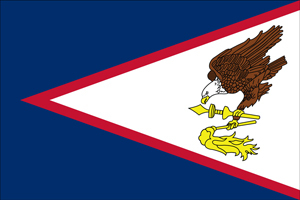 American Samoa was originally part of the country of Samoa. After disputes, a treaty in 1899 gave the eastern islands to America. The capital is Pago Pago. The weather is tropical with a rainy season from November to April and a dry season for the rest of the year. The temperature hardly varies all year round. American Samoa has a total area of 199 sq kms. It has a total coastline of about 116 kms and has no land borders. It has a total population of 51,504. Below is a map showing where American Samoa is and the flag of American Samoa. Guam is a small island in the Pacific Ocean. It is part of Micronesia. In about 2000 BC, Guam was settled by Indonesian-Filipino people. In 1521 Ferdinand Magellan, sailing for the King of Spain, landed on Guam and in 1565 Spain claimed the island. 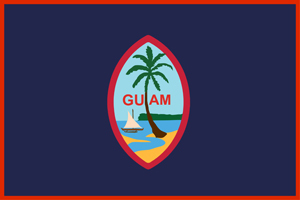 Guam was then given to the United States in 1898. In 1941 Japan invaded Guam. Heavy fighting followed and the island was retaken in 1944. It is now an important US military base. The weather is tropical with a rainy season from July to December and a dry season for the rest of the year. The temperature hardly varies all year round. Guam has a total area of 544 sq kms. It has a total coastline of 125 kms and has no land borders. It has a total population of 167,358. Below is a map showing where Guam is and the flag of Guam. 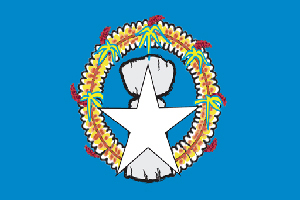 The Northern Mariana Islands are a chain of 14 islands in the north-west Pacific. Only five of the islands are inhabited. The islands are part of Micronesia. The first people to settle in the islands came from Asia some 5,000 years ago. For some time the islands and Guam were ruled by Spain. After Germany gave Guam to the United States of America, the islands were ruled by Germany. After WWI Japan took control and it was from the islands that Japan launched the invasion of Guam. The islands were retaken by the USA in 1944 and 1945 and it was from Tinian, the second largest island in the group, that the Enola Gay, the plane which dropped the atomic bomb on Hiroshima, took off. The islands are a self-governing commonwealth of the USA. The capital, Saipan, is on the island of Saipan. The weather is tropical with a rainy season from July to October and a dry season the rest of the year. The temperature hardly varies all year round. The Northern Mariana Islands have a total area of 464 sq kms. They have a total coastline of 1,482 kms and have no land borders. They have a total population of 52,263. Below is a map showing where the Northern Mariana Islands are and the flag of the Northern Marinana Islands.